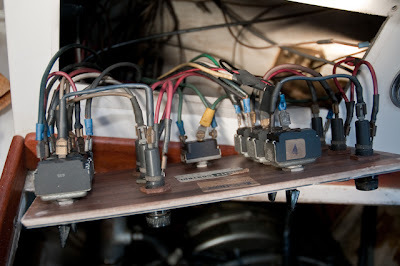 The electrical system of the boat is the infrastructure which delivers power to the electronic devices throughout. It is the batteries, the wires, and the magic that allows all the cool toys to light up and beep. I believe that Ravat's shore power system was pretty standard, although anything but compliant with ABYC codes. The automotive battery charger was not well suited to marine battery charging, none of the wires were marine grade, and there was no overcurrent protection to be found. Some changes were in order. The current wiring is a mix of lamp cord, spaghetti, and a complete lack of compliance with modern codes. It need to go and be replaced with marine grade wire, real crimped connections, proper fuses, bus bars, and a main DC panel with a reasonable number of fuses. Is that all? Ouch. The original configuration is two group 27 wet cells. I don't need AGM batteries, but I'd sure like a dedicated starter battery and a dedicated house bank. This project will add a dedicated start battery in some yet-to-be-determined location.